Frittatas have become one of my go-to meals. Not only are they relatively quick and easy to make, but the variations are endless. Though I used Sweet Apple Chicken Sausage in this frittata, you can easily substitute bacon, ham, prosciutto, or forego meat altogether. Don’t have fresh mozzarella? Substitute cheddar or swiss or…how about brie? Regardless, count on a delicious and filling meal. 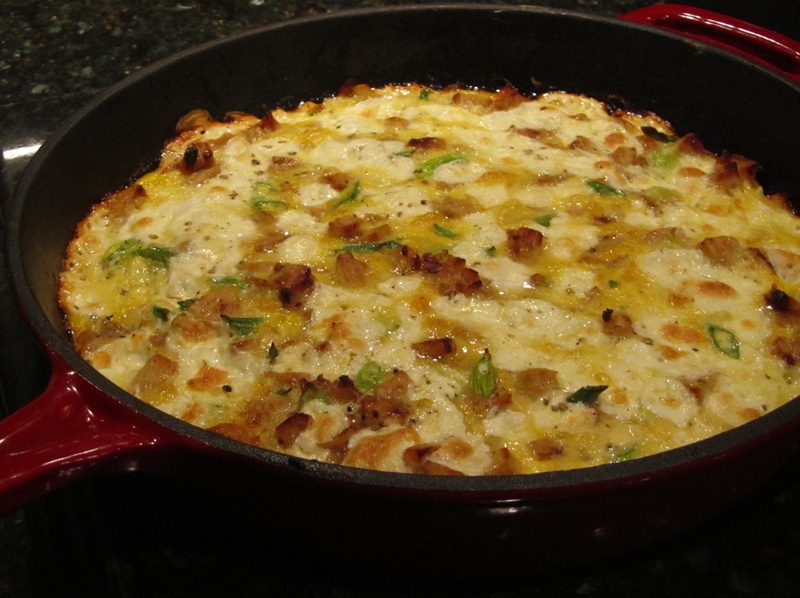 5) In medium-sized bowl, lightly beat eggs with milk; pour over potato-sausage mixture; cover frittata with aluminum foil and bake in oven 20 minutes; remove foil and bake additional 12-15 minutes until eggs are set and frittata is golden brown; serve immediately; going, going, gone! This entry was posted in Entrees and tagged Apple, Apple Chicken Sausage Mozzarella Potato Frittata, breakfast, Breakfast Casserole, Breakfast Frittata, Chicken Frittata, Chicken Sausage, Cooking, Food, Frittata, mozzarella, Potato Frittata, Potatoes, Recipe, Sausage, Sausage Frittata. Frittatas, (Frittati? ), are always on the brunch menu for the weekends here, and just about always when we have guests; they are so versatile! This is lovely, as usual,Tamara! Thank you, Tonette. And thank you for hosting me at 4F1H. It was enjoyable. It was wonderful to have you,Tamara; any time you want to visit again or promote your next publication, let me know. We got quite a number of views, by the way.Thank you! It was jumpin’ at 4F1H, if you ask me 🙂 A great exchange!